The DRAWPROJECT, hosted each year by our friends at the Annette Howell Turner Center for the Arts, Valdosta GA, is an annual Drawing Invitational Exhibition that serves as a fundraising event for Valdosta State University Art & Design students. Money raised from this event supports two prestigious scholarships benefiting outstanding Valdosta State University art & design students. The Annette Howell Turner Center for the Arts Scholarship is awarded annually to support a VSU junior art, design, or art education major for meritorious production in the classroom and a commitment to service within the community. The Danielle B. Harmon Student Merit Scholarship recognizes departmental art majors for superior classroom and studio performance. Artists are invited from the local community and from across the nation to donate original works on paper. Historically, these works have represented diverse subjects, styles, and technical approaches, resulting in an excitingly varied, high quality exhibition with something for everyone. Each year since its inception, the DRAWPROJECT has grown in the number of participating artists, the number of exhibited works, and in funds raised for student scholarships. This charity exhibition event is rooted in the support of the many community sponsors, donors, patrons, and artists who, year after year, give so generously of their time, talent, and financial resources. Additional Department of Art & Design scholarship funds are used to support annual Freshman and Transfer Student Scholarships, as well as Departmental Merit Scholarships recognizing departmental majors for superior classroom and studio performance. 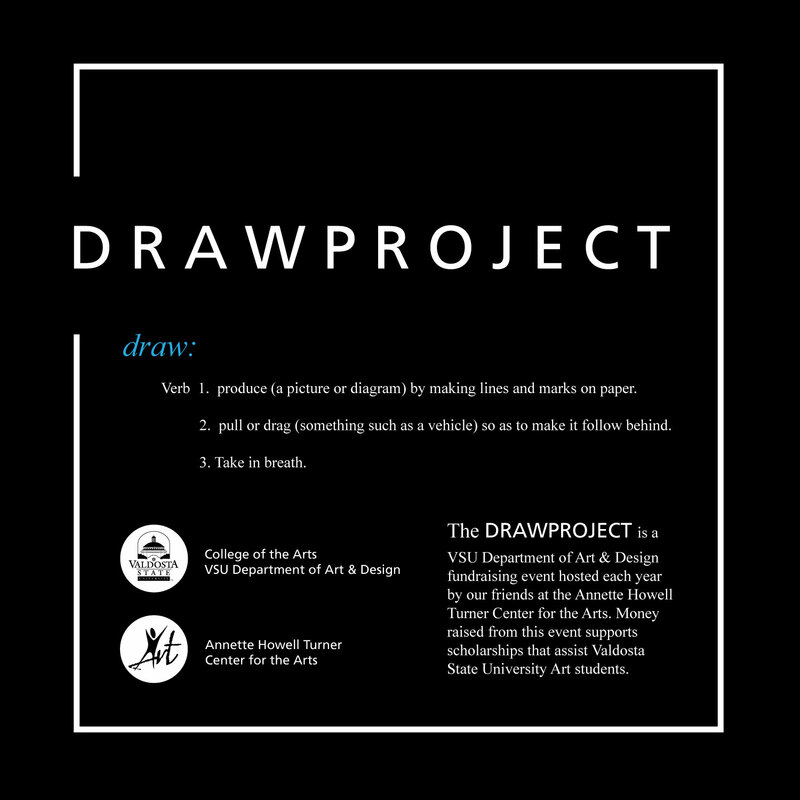 The DrawProject event is an ongoing, annual Art Project, coordinated and hosted by the VSU Department of Art & Design and the Annette Howell Turner Center for the Arts. Connect with DRAWPROJECT on Facebook. Interpret the concept of “drawing” and create an original artwork to be donated for auction. Paper will be available for pickup in the VSU Department of Art & Design - Fine Arts Building rm 1070 or the Annette Howell Turner Center for the Arts or we can send a sheet to you (140# White Stonehenge Cover Stock). The pieces will be catalogued and listed on the DrawProject Facebook Page. (Optional: send as email) Short Artist Biography (50 words or less, please), Brief Artist Statement or statement about the drawing. (50 words or less). If you are interested in participating as an artist in the 2019 DRAWPROJECT, serving as a sponsor for the event, or making a donation to support the Annette Howell Turner Center for the Arts Scholarship or VSU Department of Art & Design Scholarships, please contact the Department of Art & Design at Valdosta State University. * All art submitted becomes the property of DrawProject. * We reserve the right to reject any submissions received.